Like its pop-culture cousin science fiction, electronic music traffics in visions of the future. And just like sci-fi, the future scenes offered by electronic music can appear dated in hindsight, if not downright kitschy. This isn’t necessarily a bad thing. Our fantasies about the future tell us more about the present than they ever could about the real world of tomorrow, and past futures tell us a lot about who we used to be. But the growth and evolution of house music in all its different forms didn’t mean a lot to mainstream America, where hip-hop became the era’s ascendant sound. It did mean a lot to Europe, however. Disco never died on the continent, so when house music made the leap across the pond, it found a willing and enthusiastic audience. Acid house, although it originated in Chicago, took off in Britain in 1987 and gave birth to what would become known as rave. It was big enough at its peak that 1988-89 was later dubbed the “Second Summer Of Love,” both because of the popularity of the early rave parties and the prevalence of recreational drugs in the scene. A moral panic and police crackdown in the U.K. culminated in the Criminal Justice Act Of 1994, which succeeded in placing draconian restrictions on the kind of music that could be played at parties. In their early days, and in much of what followed, acid and rave music were singles genres dominated by one-hit wonders. Producers would release multiple tracks under multiple names. Underground hits rarely had the steam to catch on with mainstream radio, but a handful did. That was the atmosphere in 1992 when Warp Records released the first volume in its Artificial Intelligence series. In 2015, it’s taken for granted that many varieties of techno and house are designed for purposes other than dancing, but in 1992 this concept hadn’t really been proven. Dance acts had released LPs before, but Artificial Intelligence was something different. The album cover suggested a different kind of listening experience. Instead of the kind of Day-Glo early-CGI monstrosities that usually adorned rave records, this was a far more placid, downright domestic sleeve. 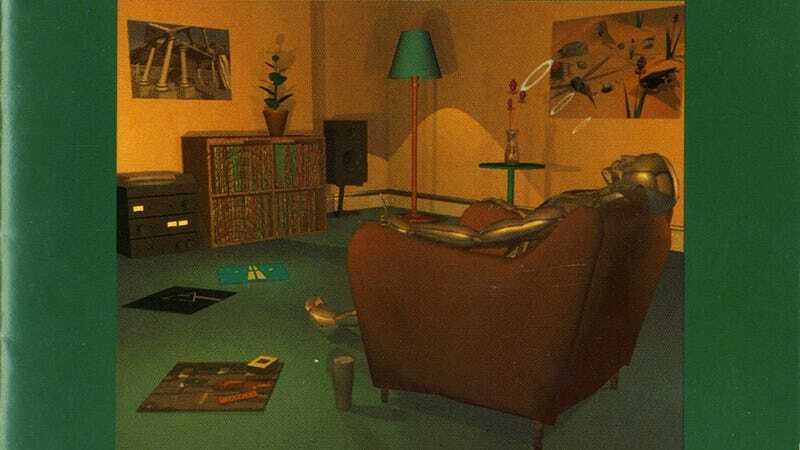 In a retro ’60s den, in a comfortable chair sitting in front of an old fashioned hi-fi set-up, a robot lies sleeping while listening to Pink Floyd’s Dark Side Of The Moon, among other records. The album’s liner notes asked the listener, “Are you sitting comfortably? Artificial Intelligence is for long journeys, quiet nights, and club-drowsy dawns. Listen with an open mind.” At the time, this was a bold claim for an electronic music LP to make. The sounds on the first AI compilation are nowhere near as strange in 2015 as they were in 1992. The subsequent 23 years have done much to normalize the music contained therein. Most of the tracks are still, at their core, acid-house tracks. The difference lies in execution: The beats have been slowed down, the bass is less pronounced, the melody lines—frantic and jagged on a normal acid-house record—have been given room to breathe. Some of the music shows the influence of ambient house, a type of dance music developed to soundtrack late nights in the chillout rooms at raves. The Orb, the group that made dance-music history with its 1991 magnum opus The Orb’s Adventures Beyond The Ultraworld, contributes the album’s closing track (under The Orb’s civilian name of Dr. Alex Patterson), a four-minute snippet of its masterpiece, “A Huge Ever Growing Pulsating Brain That Rules From The Centre Of The Ultraworld.” Although The Orb grew out of the dance clubs, it was one of the first to make the move to home listening, and its presence here signifies that the idea of dance music dedicated for private consumption was gaining steam. In hindsight, the album’s greatest strength lies in its remarkable foresight. The first track on the album is a modest acid-house number called “Polygon Window,” by producer Dice Man. This was one of many short-lived aliases of Cornwall DJ and producer Richard D. James, who later rose to fame as Aphex Twin. (1992 also saw the release of Aphex’s Selected Ambient Works 85–92 on R&S records, as well as numerous releases under James’ own Rephlex label.) This early cut is still recognizably Aphex Twin, as the frenetic snare patterns are already more rhythmically complex than feasible for dancing music. The juxtaposition between these beats and the lush ambient synths that sat atop of the rhythm section hint toward Aphex’s later mature, unsettled sound. Another of James’ early LPs, Surfing On Sine Waves—recorded under the name Polygon Window—became the second release in the Artificial Intelligence series. This album was the origin point of so-called IDM, or “intelligent dance music.” As a genre label, it manages to be both condescending and misleading. It also had the misfortune of sticking, providing a catch-all for acts like Aphex Twin that didn’t necessarily fit the club paradigm, or the more mainstream dance niche being filled by emerging acts such as The Orb, Orbital, and Underworld (who all released their first albums within a year or two of the release of the first AI record). If IDM can be said to have two main pillars, they are Aphex Twin (in all his guises) and Autechre, represented here with two tracks, “Crystel” and “The Egg.” As with the Aphex Twin contribution, Autechre’s tracks are remarkably buttoned-down in the context of the duo’s later career. But they also indicate a marked shift away from the structure of dance singles toward longer compositions with marked sections, which grow and change over the course of an extended run time. Autechre’s first album—Incunabula, really more of a singles compilation—was a later addition to the AI series. Dutch DJ Speedy J contributes two ambient-leaning tracks, “De-Orbit” and “Fill 3.” Although he would later return to hard house sounds, his early album Ginger also became an entry in the AI series. Producer Richie Hawtin appears under the name Up!, with early track “Spiritual High,” with the developing meditative beatmaking style he would later perfect under the Plastikman guise. Hawtin’s first LP Dimension Intrusion would also see print under the AI banner (under the name F.U.S.E.) Hawtin was part of the second generation of Detroit techno DJs who emerged in the late ’80s in response to the work of Derrick May, Kevin Saunderson, and Juan Atkins. A native of Ontario, he regularly crossed the border to DJ in Detroit, and later started his own label, Plus 8, with friend John Acquaviva. Plus 8 went on to release early singles from Speedy J, among others. The problem with the first Artificial Intelligence compilation from a contemporary perspective is not that the record represents some kind of lost horizon—the “road not taken” familiar from any number of sci-fi stories whose time has come and gone—but that the disc largely succeeded in its goals. As strange as this music may have seemed at the time—the offspring of a thoroughly disreputable dance music, imported from America to suddenly sprout delusions of prog-rock grandeur—it eventually became less strange as the ideas took hold in larger music culture. At times the album is downright familiar. Aphex Twin became huge, first in electronic circles, but later expanded its numbers in terms of videos played on MTV and albums sold. Last year marked James’ return to the Aphex Twin name after 13 years of relative quiet, releasing Syro to general acclaim. Autechre never went away, steadily releasing material even as its audience has drastically shifted demographics. Nobody really uses the term IDM anymore, which is a good thing. Artists who would have flown under the IDM banner 15 or 20 years ago—acts as diverse as Arca, Caribou, and Burial—are free to inhabit a genre landscape far less straitjacketed than the one that existed when Artificial Intelligence first hit shelves. The phrase “experimental music” doesn’t really seem appropriate here. It’s misleading to imply that these artists were merely experimenting on their way to something more conclusive. Although every producer on it would go on to a have a long and storied career, the album’s music is satisfying enough on its own terms. The most remarkable thing about Artificial Intelligence is that the immaculate sound utopia it predicted actually came to pass, at least partially. All you need to do is turn on the radio and hear whichever twitchy Neptunes track is currently rushing the charts. Listen to any Radiohead album recorded since 1997—or any of the dozens of other groups that have made Radiohead records since 1997—or any number of up-and-coming beatmakers who keep trying to recreate the wheel by dismantling the 4/4. What was once the sound of the future became the sound of the present, and we’re still living there today. Check out the trailer for Ex Machina here and RSVP for a special advance screening on 4/16 here.